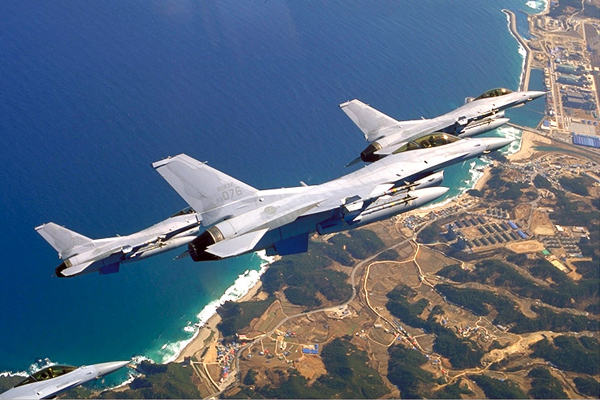 Raytheon to upgrade South Korean F-16 Fighting Falcon with AESA radars. Raytheon Company announced today its Raytheon Advanced Combat Radar (RACR) has been competitively selected by the Republic of Korea to upgrade the country's KF-16C/D Block 52 Fighting Falcon fleet. "This win ensures the Republic of Korea's KF-16 combat aircraft remain relevant in a constantly evolving threat environment and builds on our legacy of providing enhanced combat capabilities for global allied forces," said Rick Yuse, president of Raytheon Space and Airborne Systems. Subject to final definition by the United States Government, Raytheon will deliver 134 active electronically scanned array radar systems with deliveries anticipated to start in late 2016. The scope includes AESA radar development, production of test assets for the system design and development program, and production. Raytheon has demonstrated F-16 platform expertise by delivering mission critical avionics systems including the modular mission computer, electronic warfare systems, and various weapons. This selection adds the F-16 Fighting Falcon to the family of fighters retrofitted with Raytheon's AESA-based radars (F-15C, F-15E and the F/A-18E/F). "RACR complements and leverages Raytheon's F-16 avionics heritage to provide the lowest risk, most affordable and highest reliability AESA retrofit solution," said Jim Hvizd, vice president of International Strategy and Business Development for Raytheon's Space and Airborne Systems business. "This experience has directly contributed to the ease of installation and performance that continues to exceed customer needs." The Republic of Korea selection bolsters Raytheon's AESA radar production base, which has already delivered more than 500 AESA systems worldwide, supporting more than 400,000 operational tactical flight hours, both industry firsts.